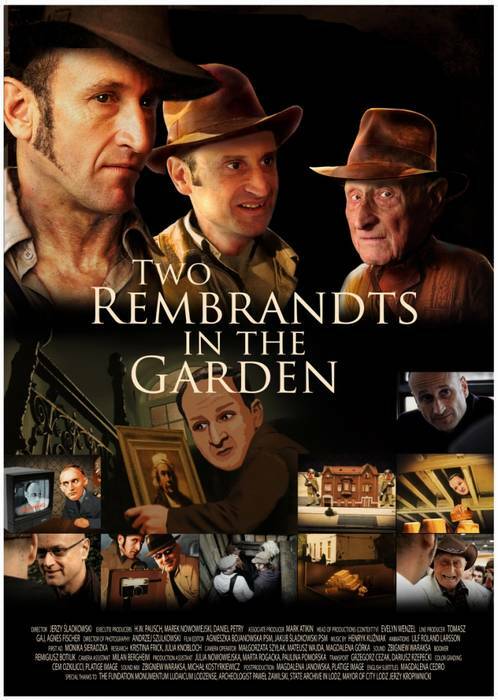 "Two Rembrandts in the Garden" is a documentary telling the story of Mark Atkins, an Englishman in search of both his Jewish past and his family's buried treasure. Jack Atkins, Mark's grandfather, is the manager of the successful family-owned textile factory. With only a few hours left before fleeing to London, he gathers his belongings and buries them in the garden of his home in Lodz. He is the only person who knows where this treasure is buried but eventually he does pass the secret on to his son David, Mark's father. Mark Atkins sets off on a deeply person treasure hunt. He finds part of his family Los Angles. He comes to know the details of his family's involvement in the war, their flight from Poland and the Holocaust. He hears anecdotes that begin in Riga and continue through Lodz, London, and Cuba ending in the United States. Continuing to trace his history, Mark finds himself in the once-thriving city of Lodz where the old family house still stands. In Los Angeles, he finds a part of his family and the key to his own history. He comes to know the details of his family's involvement in the war, the flight and expulsion from Poland, and the Holocaust. He hears fascinating anecdotes of a family history that began in Riga and continued through Lodz, London, Kuba, and finally the United States. Director Jerzy Saldkowski ("Swedish Tango") transports us into the history of European Jewry and its countless buried treasures. The past acquires a fascinating relevance as Mark Atkins journeys through the political realities of modern Poland and the memories of the few remaining survivors of a lost time.